Remodeling a kitchen or bathroom can be a serious undertaking, but it can also be a great opportunity to add a touch of playfulness to your home. Whether you are remodeling a powder room, a master bath, or a kitchen, the Harrell Remodeling design team excels at creating modern residential designs while also developing special spaces that reflect the personality and spirit of the homeowners. Americans are staying in their homes longer than ever before, opting to renovate or remodel rather than move to a larger residence. Families in the 1950’s typically moved approximately every five years. Since 2013, most people tend to stay in their homes an average of nine years compared the year 2000 when they moved every seven years. 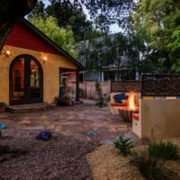 Many Bay Area and Silicon Valley residents are following this trend and as a result, personalized remodeling designs that are unique and individual are becoming more popular. Gloria Carlson, a senior designer at Harrell-Remodeling, loves to create fun and creative designs that reveal her clients’ unique personalities and passions. “The number one thing I do when I have a specialized design project is to listen. I want to understand what they are looking to achieve, both functionally and aesthetically, so that I can help to realize their dreams,” said Gloria. 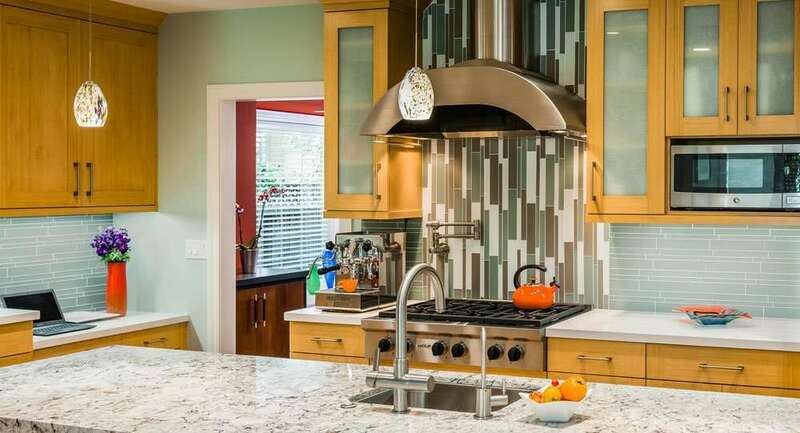 Here are three examples of Harrell Remodeling clients who wanted to express their individuality in their kitchens and bathrooms, and how Gloria’s exceptional talent for creating enjoyable and useful designs were incorporated in these projects. A baking area that included an appliance garage for small appliances, offered efficient storage for flours, mixing bowls, utensils, etc. in adjacent cabinetry. This zone was situated directly next to the oven. The coffee zone was designed to hide coffee containers, filters, and boxes of teas, and Gloria made sure the espresso maker aligned perfectly with a potfiller faucet to fill the machine’s water tank. In the center of the kitchen, Gloria designed a large island to function as a buffet serving area, prep zone, and gathering spot. To help contribute to the central gathering purpose of the island, Gloria specified a faucet that included a built-in filter, water chiller and carbonation system at the sink. An under-the-counter refrigerator and built-in liquor cabinet made the island a refreshing kitchen hangout. A planning zone with organizer shelves, key hooks, and a cork board and white board was designed to add a functional focal point to the room. 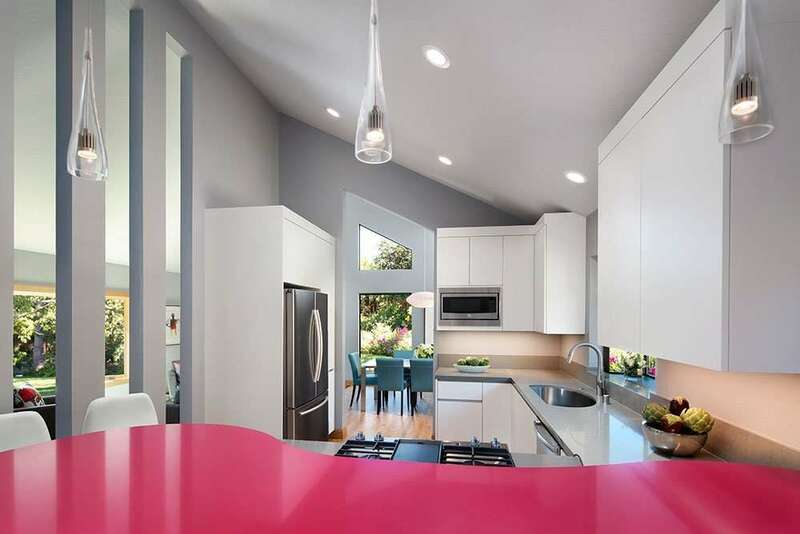 Color was integrated into the kitchen to highlight the modern upgrades and to make the space visually appealing and inviting. “My clients still tell me how much they love what I did in their kitchen,” said Gloria. Gloria worked with another family who entertained frequently. These homeowners wanted an area for guests to gather away from where they were doing their last-minute cooking, and they requested a built-in soda fountain, for their own love of sodas and for fun entertaining. A separate beverage zone was created on the opposite side of the prep zone and kitchen sink. The beverage area was designed in an “L” shape that allowed for plenty of storage space both above and below the wet bar area. At the beverage center, Gloria specified plumbing for a carbonator, refrigeration line, filter system, and a fully loaded bar gun with a multitude of syrup flavors required for making fresh sodas. To punctuate the theme with a really fun and unique design, Gloria designed a backsplash that was made up of vintage bottle caps. 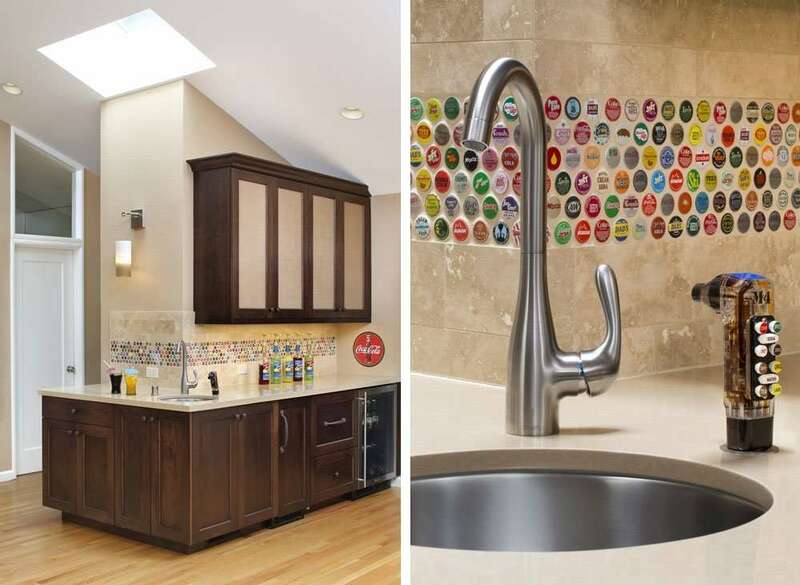 Hundreds of bottle caps were individually placed in the backsplash to resemble tile, resulting in a customized conversation piece that echoed the homeowners’ affection for soda. 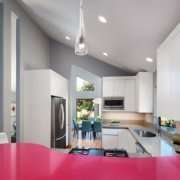 This clever kitchen redesign melded the clients’ passions to create a nearby entertainment space for guests while also allowing the homeowners to simultaneously work in the kitchen and interact with their guests. Sometimes a client just wants to forego all traditional design concepts, and allow Harrell Remodeling and its amazing designers to create something truly fresh and new. This was the case with a Bay Area family who wanted their home to reflect their passion for travel and desire to welcome nature into their children’s bathroom. This family traveled the world, collecting magnets from each place they’d visited as tokens of their adventures. Gloria noticed they mounted their collection of magnets on a large whiteboard attached to a kitchen wall. She replaced this bland whiteboard with customized world map wallpaper, with colors to match the kitchen palette, which was adhered to a steel plate to make the map magnetic. The new design allowed the family to place their magnets on the specific countries and cities, while creating a showcase piece that sparked conversation during dinner parties. A unique combination of tiles was applied to the bathroom walls to give the space a jungle vibe. 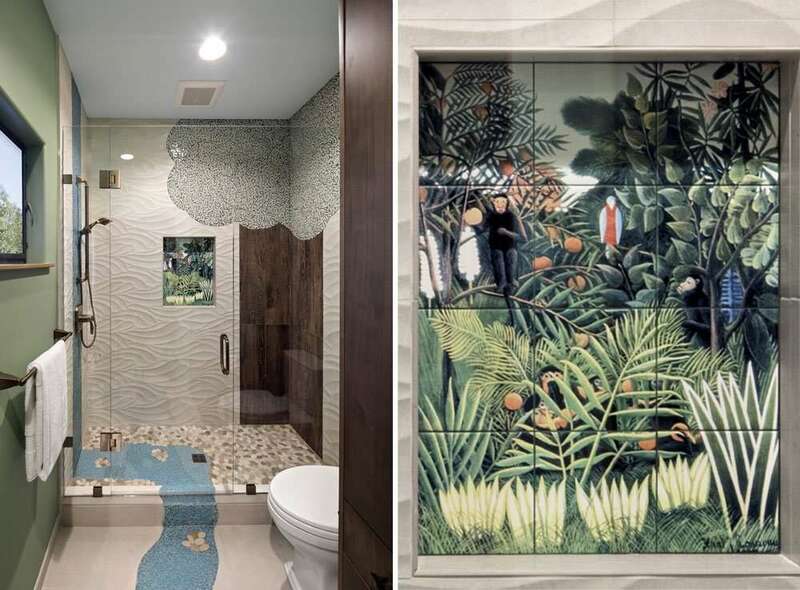 A niche in the shower showcased a tile mural with a family of monkeys hiding in a rainforest. 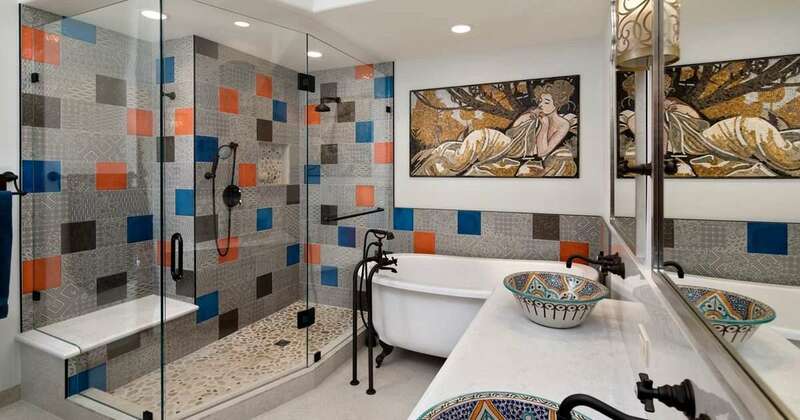 Beneath the showerhead, Gloria designed a glass mosaic blue tile waterfall that flowed down the wall, across the shower pan, and onto the bathroom floor to create meandering river. The blue tile river stops in front of the vanity in the shape of a small puddle of water. Gloria used porcelain tiles with a wood grain to create a large tree trunk design on the shower wall and a leafy mosaic tile and green grout to create the foliage. The results for this home were spectacular, playful, and completely customized for the client’s lifestyle and personalities. We invite you to contact us for a complimentary consultation to discover how Harrell Remodeling can design your next distinctive space. Do you envision slipping into a deep tub, or even stepping into a relaxing hot shower after a long and perhaps stressful day at work? Designing your bathroom to fit your lifestyle will give you the oasis you seek. In a fairly short amount of time, the bathroom has gone from “utilitarian” to a space that is a relaxing respite. Bathrooms have evolved into a place to unwind or decompress after a long day, and/or a place to invigorate your morning routine, as you set off for the day ahead. For some of us “oasis” might mean a walk-in curbless shower, a deep soaking tub or perhaps an infrared sauna. Many infrared saunas also come with Bluetooth capability, allowing you to stream your favorite Pandora station or iTunes. With proper planning and design, each of these can add a touch of luxury to your bathroom remodel and soon, to your morning or evening routine. We all have a similar desire for the bathroom – a purely functional place at times; and a place to relax, decompress and simply get away from life’s hectic pace. All you need now is a fluffy robe and a candle or two. Outdoor living is here to stay. The yard and garden become a part of the floor plan when sliding glass doors or retractable glass walls such as nana-walls™, open up the home and lead to patios and decks, either covered or open to allow for natural light. Outdoor rooms may even include kitchens with sophisticated sinks and grills, including features such as built-in fireplaces, eco-friendly fire pits that burn clean fuel (ethanol) , LED lighting in a variety of colors including water-proof rope lighting discreetly hidden along fences, pathways or decking. 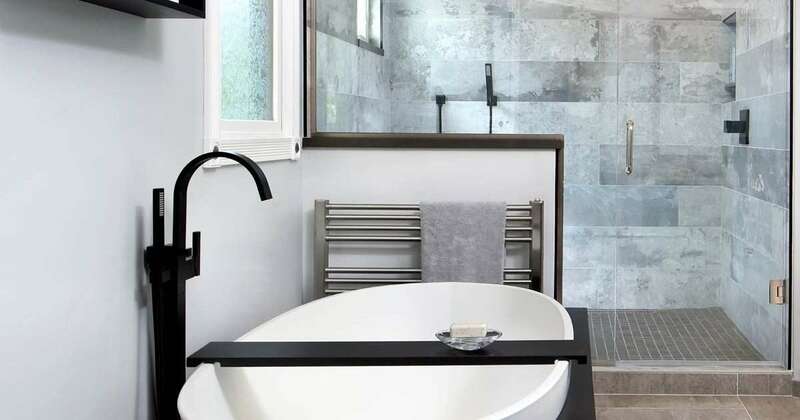 When planning a bathroom remodeling project, many homeowners are interested in enhancing the design and functionality of their bathtub or shower by including more convenient and attractive storage or seating for their bathing needs. Three options for this purpose are shelves, niches and benches. Shelves are typically attached to the corner of the shower and are triangular in shape. The size and height of each shelf affects what it can hold and how easy it is to reach. When planning a bathroom remodel, designers should make sure that the protrusion of the shelves into the shower space doesn’t interfere with elbow room. Shelving should comfortably hold items like shampoo, conditioner, soap, body wash and other bathing necessities. The distance between each shelf should take these sizes into consideration. Moreover, a detail-oriented design/build remodeling company will be sure to place the shelves in a way that avoids a direct stream of water. Sometimes confused with shower shelves, a niche is a recessed area embedded into the shower wall. The edges of the niche can be curved and soft or sharp and distinct to coordinate with the design of the remaining wall space. The niche was once just a small area to hold soap and offer a handle to grab when taking a bath, however today’s showers and tubs have single, double and even triple niches built in to accommodate all the homeowner’s bathing supplies. They are sometimes used instead of, or in addition to, shelves. Their placement and size should be large enough to replace the shower caddy as the catch-all for bathing items. One of the growing trends in bathroom remodeling projects is the use of benches in showers. 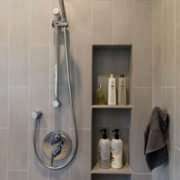 These attachments or built-in extensions from the wall are ideal for people with balance and mobility issues, homeowners who are thinking about aging-in-place, anyone who desires a more comfortable shaving position, and people who just like the comfort of sitting while showering. Bench seating offers a place to relax without having to step down into a tub, although it must be sized appropriately to still allow ample standing space within the shower. Take a Peek Into Our Shower… Options! When it comes to your bathroom remodel, designing a comfortable, functional yet beautiful and maybe even creative shower is probably at or near the top of your priority list. It’s one of the first things we do in the morning, and for some a necessary part of the ritual of waking up and facing the day. Choosing just the right materials, textures, colors, shower door and framing options can be one of the fun aspects of planning this part of your bathroom remodeling design for your unique San Francisco Bay Area home. One advantage to a sliding door is that it can move aside on rails or into a hidden wall pocket. For smaller bathroom spaces, a pocket that hides the door in a wall maximizes functional space and can be a sleek alternative in smaller bathroom. A hinged door creates a more solid and defined enclosure. Metal or stone structures offer a more defined space. Hinged doors swing into the shower or out into the rest of the bathroom space, so be sure that there is ample room between the shower and the adjoining elements – you don’t want to open your shower door into your toilet or bidet. Hinges can be attached to a wall or to a frame. Choose waterproof materials that are rust-free and low maintenance / easy to clean. A shower without a frame opens up and gives the illusion of space, thus making a small to medium size bathroom feel larger. It can also highlight any accents you have in the shower, such as mosaics, listellos and other tiling patterns. A custom designed tile pattern, whether simple or complex, can create just the right feel and enhance your bathroom and ensure it stands out among the hundreds of other beautiful bathrooms you may have seen throughout our San Francisco Bay Area. 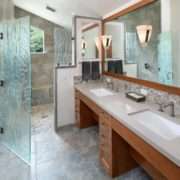 Frosted glass is a popular option for those who want added privacy. While this takes away from the open and spacious effect that comes with clear glass, it has the added effect of seclusion when you’re inside. Cast or patterned glass is beautiful to look at, but may reduce the amount of light from inside the shower, but is an innovative privacy alternative to frosted glass. And with the advent of water-proof LED lighting, and specialty ligthing you can create a colorful or monochromatic lighting plan that can soothe or energize your shower experience while providing a solution to the lack of natural light. Traditional tempered glass has a slightly green tint from its iron properties – this glass embraces a contemporary style/design or offers an opposing cool feeling to an otherwise warm-toned bathroom. It can also lend itself to spa-like feel, and with the addition of some cucumber scented water, you may never wish to leave. Clear glass (low-iron glass) is a popular choice for people who prefer a clear glass without the slight green tint. This is especially desirable for white or light motifs, or where there is a significant amount of color already in the bathroom, where the preference for the shower enclosure is that is fades quietly into the background. For more information about choosing the right shower enclosures for your bathroom remodeling project in the San Francisco Bay Area, we would welcome you to give us a call, and speak with one of our knowledgeable design + build employee owners. https://harrell-remodeling.com/wp-content/uploads/2013/09/bay-area-shower-remodel-251x300-LARGER.jpg 1076 900 thepointcollective https://harrell-remodeling.com/wp-content/uploads/2017/09/Harrell-Remodeling-Logo.png thepointcollective2016-10-03 09:48:402018-11-19 15:20:08Take a Peek Into Our Shower… Options! 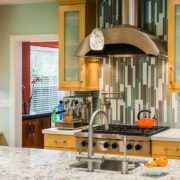 When it comes to Bay Area home remodels, flooring options can affect the look, feel and sound of any room in the home. Some types are more environmentally-friendly than others. While flooring choices are nearly endless, here are four popular choices in Bay Area remodeling. Marmoleum is a type of linoleum made by Forbo Flooring Systems. Its roots are in the phrase “marbleized linoleum.” Marmoleum is anti-static, anti-microbial, is easy to keep dust-free and is ideal for people with allergies. It’s a solid choice for kitchens and bathrooms because of its naturally clean features and lasts between 25 and 40 years. Vibrant color and pattern choices are diverse, separating it from its stereotypical ancestry of linoleum. This green material is not based in petroleum, but in linseed oil. It is one of the greenest flooring materials on the market today. Vinyl flooring has long been a popular choice in flooring for any room in the house. From kitchens to living rooms to hallways to bedrooms, Amtico flooring is a popular choice for remodeling projects. 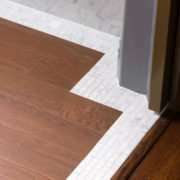 Manufactured by a British company, this is a higher line vinyl floor known for use with accents, designs and patterns. It discolors with high heat, and protective floor guards will keep it from getting scratched by furniture. An Amtico floor dressing will provide added protection from scuffs, spills and scratches. Cork flooring is a sustainable material that comes in as many as 40 different shades of color and a variety of patterns. It is comfortable to walk on in bare feet and is an excellent choice as a noise barrier. Use it for upstairs floors or for rooms where quiet is appreciated. Although it is insect-resistant and can last for years, it is susceptible to scratches and dents from furniture, sharp objects and high heels. Cork flooring is practical for people with allergies, but fades under constant light and warps with high humidity. Use it in any room in the house except the bathroom and laundry room. Hardwood floors are durable, ranging in color from blond to black. Exotic and domestic woods offer high quality. They blend well with any decor and will last for years when sealed. Medium shades show less dirt than dark or light hardwoods, and placing mats by high traffic exterior doors is wise. Hardwood flooring lasts more than 100 years and can be refinished or repurposed to extend its life. Hardwood floors are good for people with allergies and are easy to keep clean. These shower drains may not help you become the next great innovator, but they will inspire you. Everyone loves to luxuriant in the shower, and what better way to enhance the beauty of your water oasis than with a stylish and highly functional drain? These drains are not only decorative, they can melt into the tile floor with ease, or light the way, should you desire an escape from the daily glare of overhead lighting. How relaxing to shower with only the soft glow of the LED to light the way! Quartz Aco is a linear drain system that offers artistic solutions to shower drainage; there are several decorative grate styles and optional LED water activated drain lighting that adds chroma-therapy to your bathing experience. Also, you can run the linear drain at the base of the shower wall allowing the shower floor to slope in one direction, creating less complex draining angle configurations and easier to install popular large-format tiles right on into the shower.